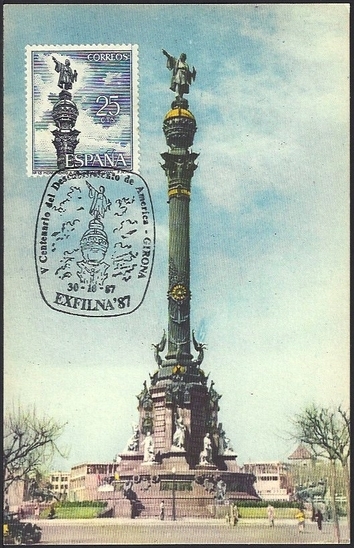 Spain Scott #1280 (17 Mar 1965) Columbus Monument in Barcelona, Spain where the Catholic Kings received Columbus on his return from his first voyage. This monument as shown on the postcard stands at a height of 187.5 feet (57.2 meters). It was dedicated on 01 June 1888. 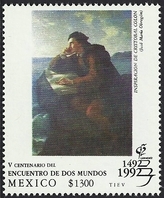 The statue of Christopher Columbus at the top of the monument is of bronze and measures 26 feet and 3 inches (8 meters). Note the pictorial cancellation of 30 Oct 1987. At the top of the column (beneath the statue of Columbus) is the princely crown of Catalonia. There is a balcony around the crown to which visitors are carried by an elevator which runs in the column. If you get the chance, do go up the elevator and watch the people as they stroll to the bottom of the famous La Rambla at Port Vell.